If you were confronted by a bad dude what would you do? Do you have skills it takes to deal with a camping trip gone bad? 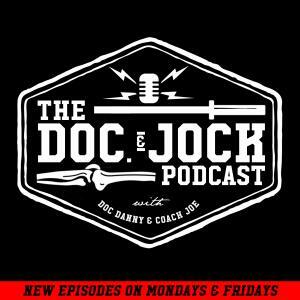 On Episode 190 of the Doc and Jock Podcast we sit down with Clint Emerson (a.k.a The Violent Nomad) the man that helps you answer these questions "yes I can handle myself in these situations." Clint Emerson, retired Navy SEAL, spent twenty years conducting special ops all over the world while attached to SEAL Teams (including the elite SEAL Team SIX) and the National Security Agency (NSA). Utilizing an array of practical skills he developed to protect himself while at home and abroad, he created Violent Nomad—a personal, non-kinetic capture/kill program cataloguing the skills necessary to defend against any predator or crisis. Out of that system Clint has written 2 books 100 Deadly Skills & 100 Deadly Survival Skills.